During the first half of the twentieth century, Europe was engaged in an atrocious fight against fascism. Fortunately, the Second World War put an end to some of those terror regimes, but sadly enough, in the Iberian Peninsula the wrong guys won the war. For more than forty years, both Portugal under Salazar and Spain under Franco suffered stern totalitarian dictatorships. In Spain, after thirty six years in power, the dictator peacefully passed away in his deathbed. Neither a revolution nor an invading army in the name of freedom overthrew him. Franco simply died of old age, and a big part of the machinery of propaganda and bureaucracy was silently and quietly passed on to the newly born democracy in 1975. Unfortunately, the history of the Civil War, the coup d’état of Franco’s forces against the rightful Republican government, and the decades of dictatorship have never been analysed and discussed in depth in the public discourse (especially because of the 1977 Amnesty Law that meant a forced forgetting of the memories of the concentration camps, the tortures, the executions, and the human rights violations). However, as Freud repeated once and again, whatever is repressed is bound to return in one way or another, and will haunt us until we manage to come to terms with the traumatizing truth of the dictatorship. Countries like Germany have worked through –and continue working through– the horrors of the Nazi nightmare. But official voices in Spanish government keep on denying the fact that Franco’s regime was a dictatorship and a fascist terror state of repression. 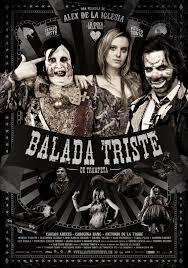 When I watched Alex de la Iglesia’s Balada triste de trompeta (The Last Circus), all these ghosts of repressed cultural traumas jumped out of the screen in a sort of return of the repressed. De la Iglesia’s movies always have a very peculiar atmosphere (a very personal style comparable to the subjective worlds of filmmakers like Jean-Pierre Jeunet or Alejandro Jodorowsky), and seem to stand in a very thin line between the mainstream blockbuster and the grotesque B-movie. With the flavour of the comic strips that the film director used to create in his young age, films like the cyberpunk craziness of Acción mutante (1993), or the heavy-metal satanic-apocalyptic film, El día de la bestia (1995), are definitely worth watching. Grotesque could be the word that best defines The Last Circus. Whereas the frenzy of de la Iglesia’s previous films seemed to enjoy a certain teenager fever for gore and guts, this time his movie engages with the many ghosts that lie beneath the tombstone of the dictatorship and have been passed on to the adult Spanish democracy. The film presents the story of Javier, the son of a circus clown (Santiago Segura) who unwillingly got involved in the Spanish Civil war in the Republican side. During a battle in Madrid in 1937, the clown was taken prisoner and became one of the many forced-labour prisoners enslaved in the construction of the Valle de los Caídos –a church dug inside a mountain that would, in time, become Franco’s mausoleum. In the construction of this huge fascist symbol, not only did the clown die, but so did more than twenty thousand political prisoners. Always conscious of this traumatic past, the movie follows the life of the clown’s son, Javier (Carlos Areces), as he also becomes a member of a circus in the early 70s, during the last years of the dictatorship. Javier is a meek and feeble man, incapable of expressing hate or anger, and he lives in a continuous state of numb depression and melancholia. He is hired as the sidekick of Sergio (Antonio de la Torre) in a clown show where he receives all the beatings and is the object of the humiliations that make children laugh. In real life, Sergio proves to be as horrible a torturer as he is on stage: he is a maniac, patriarchal monster that terrifies everyone and repeatedly beats his girlfriend, Natalia (Carolina Bang). The framework for the tragedy is set when Javier falls in love with Natalia, and starts dating her. Natalia, then, passively debates herself between the love of the meek “sad clown,” Javier, and the lust of the aggressive “silly clown,” Sergio. The storyline relentlessly develops towards a grotesque physical and psychological metamorphosis of the characters that will finally depict, in their faces and their horrible actions, the monstrosity within their memories and souls. Wonderful site. I am forwarding it to friends who teach Spanish in the U.S. Thank you for visiting and following my site.